Jordie Donachie in Gaming on 4 March, 2012. As a kid, I remember watching my brother playing on Silent Hill 1 and more or less saw it to completion. The game scared the hell out of me, but I wanted to watch it until the end. It was nothing like I had ever seen before and the storyline within it was flawless. I recently replayed this game with a couple of friends and completed it during the very early hours of the next morning. We hadn’t slept for the whole night and we just stayed up playing on Silent Hill to reach the ending once again. I realised that it is the unique experience delivered whilst playing Silent Hill that is why the game series is so successful. This experience is apparent in the 1st 4 games of the Silent Hill series. I began wondering how the creators of Silent Hill (Team Silent) achieved the phenomenal goal of creating an experience like no other and I believe the smallest things added to these games have helped to accomplish this. One example of this is how conversations in the game are presented. 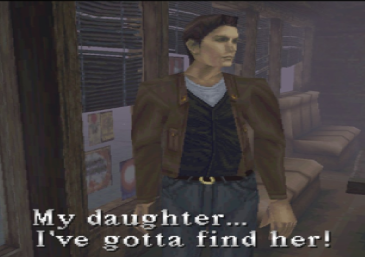 Whilst in the diner at the start of Silent Hill 1, I got irritated at how dissipated the conversation was but I began to realise over the length of the game that it was these dialogues that added a lot to the core ambience. There are long pauses between sentences and everything is spoken at a relatively slow speed. I was quick to blame the hardware capabilities at the time, but this style of speech is also present in 2, 3 and 4 and was used to haunting effect. This is a small thing which anyone could overlook and disregard as a sign of age in a dated game; however it works with the dream-state style the game presents and enhances the overall experience of the player. This is where the genre of psychological horror truly stands. Silent Hill 2 gave players the same world as Silent Hill 1 but personalised it for the protagonist, James Sunderland. If you want to explain to someone the idea of the unconscious mind, show them Silent Hill 2 and the ideas present behind it. At the start of the game you find out that James has entered this town after receiving a letter from his dead wife. Playing through this game, you begin to realise that this town could be James’ unconscious mind, the physical presence of certain things are seen as a part of James’ psyche. The most prominent being James’ sexual frustration: the infamous Pyramid Head and the many female formed abominations sprawling the town. The complexity of this idea spreads throughout the whole of the game and even though some parts of it may be too subtle to grasp the first time round, it all adds to the games overall experience. After Silent Hill 3, Team Silent took a new direction by trying to create a game not attached to the Silent Hill universe. However, during the making of this new psychological horror, they decided to add it to the Silent Hill series to bolster advertisement, naming it Silent Hill 4: The Room. Out of any game I have ever played, this game gave the most uncomfortable experience. There are many parts which put you on edge, but the tension never goes away. I have yet to complete Silent Hill 4 but from what I have played it is evident that Team Silent still knew at that time how to create a psychological horror game effectively. And that is where the game series ended in my opinion. A game series with ‘quick tips’ during every loading screen. A game series where you are able to unrealistically commando roll out of the way of nearby enemies. A game series with quick scares and no prolonged tension. A game series which includes Pyramid Head where he isn’t needed. Konami have completely changed the style Silent Hill rose to fame with and has now thrown in a familiar formula which every other game has. This familiarity was obviously created to generate a wider audience, but has ultimately ruined a great series. All I want is another true Silent Hill experience created by Team Silent; not a game which sacrifices the gaming experience for a larger profit. With the imminent release of Silent Hill: Downpour, I don’t believe we will be getting an experience the series and fans deserve. Silent Hill: Downpour will be released on the 13th of March. Take my advice and wait to buy The Silent Hill HD Collection on the 20th.